Aix is one of the most attractive cities in Provence. It has everything you imagine from a city in the south of France. Its Roman remains include a great spa and elegant boulevards and old quarters invite you to stroll around. Just 25 kilometers from Marseille, the two cities could not be more different. Marseille, despite its recent huge building and improvement works, remains an urban mass with a gritty feel. Aix, on the other hand, is one of the world’s great art cities. Paul Cezanne was born and lived here, along with his friend the writer Emile Zola. It’s a big university town as well, with students from all over the world, and particularly the U.S.A. contributing to its lively nightlife and vibrant culture. Good hotels, excellent restaurants, and great shopping, along with the Paul Cezanne connections add to its seductive appeal. Aix-en-Provence is 760 kms (472 miles) from Paris, and the journey by car takes around 6 hrs 40 mins. TGV high-speed express trains run regularly from Paris Gare de Lyon; you can also fly to Marseille-Provence Airport. Aix started as a Roman city, Aquae Sextiae, was largely destroyed by the Lombards from Italy in AD 574, then by the Saracens. 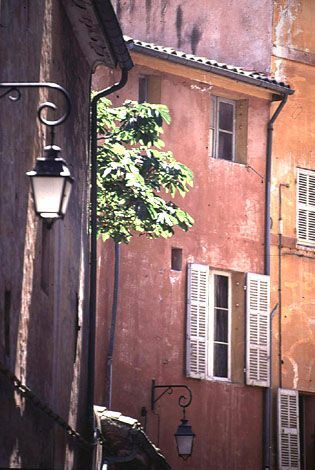 It was rescued by the powerful and wealthy Counts of Provence in the 12th century, who made Aix their capital. In the 15th century Aix became an independent country under the beloved ruler, ‘Good’ King Rene of Anjou (1409-80), who supported Charles VII of France against the English and their allies the Burgundians. The Good King turned the court into an intellectual powerhouse and also introduced the muscat grape to the region, so look for his statue with a bunch of grapes in one hand. Incorporated into France in 1486, Aix‘s fortunes waned but were restored when Cardinal Mazarin, Chief Minister of France under Louis XIII and the Sun King, Louis XIV, stabilized the country. Provence prospered, with Aix becoming a wealthy city. Since then the town has quietly prospered and today you can see much of its history in the Roman remains and the classical buildings that fill the Old Town. The Old Town: Vieux Aix is a wonderful place to stroll around, centering around the boulevard cours Mirabeau shaded by mature trees from the hot southern sun. This is the place to sit on a terrace, sip a coffee and watch the world go by. The Cathedral St-Sauveur on rue Gaston-de-Saporta is full of medieval art, with its most famous possession the triptych commission by King Rene in 1475, Le Buisson Ardent (The Burning Bush). Nearby you come across the former bishop’s palace which houses the Tapestry Museum, well worth a visit both for its unique historic tapestries and its contemporary section. The Quartier Mazarin to the south of the Cours Mirabeau was laid out in the 17th century. Here you’ll find the Musée Granet in a 17th-century Knights of Malta priory. It’s known for its collection of nine Cezanne paintings, as well as works by Picasso Leger, Matisse, and Giacometti. Admirers of Paul Cezanne have a field day in Aix. He was born and lived here, so there’s plenty connected to the great Impressionist painter, including a fascinating walk organized by the Tourist Office and visits to his home. The Cité du Livre (the City of Books housed in an old match-making factory houses the M&eactue'jane library (the Marquis de Méjane left his considerable library of 80,000 books to the city in 1786), the Prejlocaj Ballet, and much more. It puts on major exhibitions and events. For a complete contrast, visit the Fondation Vasarely on avenue Marcel-Pagnol. The building itself is modern; inside are some extraordinary exhibits of the visionary architect/artist. If you want to take the waters, as people have been doing since the Romans discovered them, visit the spa center, Thermes Sextius. The Aix Pass Card: Buy an Aix Pass Card for Aix-en-Provence and Aix region for 2 euros and you get a discount on entrance fees at all the participating sites (marked with the ‘Aix and its region’ seal). Buy the Card at Tourist Offices, museums, sites and monuments. It also gives you a reduction on Aix network bus which can take you to other nearby parts of Provence. Cézanne Pass Buy the Cézanne Pass for 12 euros to visit Paul Cezanne’s workshop, the Jas de Bouffan family house, and the Bibemus quarries. The Tourist Office organizes good guided tours, from Discover Old Aix to In the Steps of Paul Cezanne. Tours are on foot, last 2 hours and are in English at certain specified times. For more information, click on the Guided Tours Page of the Tourist Office. Aix-en-Provence is a shopper’s delight. There are markets every day for fruit and vegetables, while on selected days you can browse among antiques and bric-a-brac. The shops in Aix are chic and tempting. If you like taking a piece of tradition back with you, consider a santon (crèche figurines much sought after and used in France at Christmas and Easter). Patisserie shops and delicatessens selling chocolate treats and the famous calissons d'Aix (candy made from ground up almonds) tempt you through their doors. The city also has good shops for gifts, whether you're after that bright Provencal cotton for tablecloths and cushion covers, soaps delicately scented with lavender or any number of different styles baskets to carry the lot home in. Hotels in Aix-en-Provence are expensive; this is a chic city with chic prices. If you want top end charm, try the Villa Gallici (Ave de la Violette, tel. : 00 33 (0)4 42 23 29 23). It’s elegant, chicly decorated with Provencal fabrics, has a swimming pool and is five minutes to the town center. The Hotel des Augustins (3 rue de la Masse, tel. : 00 33 (0)4 42 27 28 59) was once a 12th-century convent belonging to the Grands Augustins order, so expect plenty of vaulted ceilings and stone walls. It’s charming with cozy rooms in Provencal style. Only breakfast is served. For a more modest option, try the Hotel St. Christophe (2 ave Victor Hugo, tel. : 00 33 (0)4 42 26 01 24) where you have a choice of rooms and budgets. There’s a very good selection of restaurants in Aix-en-Provence. For the top end, Le Clos de la Violette (10 ave de la Violette, tel. : 00 33 (0)4 42 23 30 71), is the one to go for. Modern French cooking in a delightful Provencal villa with a garden from a Michelin one-star chef. Menus 50 to 130 euros. Cote Cour (10 cours Mirabeau, tel. : 00 33 (0)4 42 93 12 51) offers innovative cooking in an old building which has received some pretty wacky modern touches with its lighting, seating and table settings. Menu 42 euros. La Tomate Verte (15 rue des Tanneurs, tel. : 00 33 (0)4 42 60 04 58). The Green Tomato is as delightful as its name. The modern bistro offers local Provencal cooking in a pretty setting with the advantage of a terrace in the old town. Menus 18 to 32 euros. Brasserie Les Deux Garcons (53 cours Mirabeau, tel. : 00 33 (0)4 42 26 00 51). It’s the grand brasserie décor and the enclosed terrace that are the main attractions here. Brasserie style staples make up the menu. There’s plenty to do in Aix in the evening. There are plenty of open-air cafes and bars for drinking in the summer months around rue de la Verrerie and place Richelme. Le Mistral (3, rue Frederic Mistral, tel. : 00 33 (0)4 42 38 16 49) is the hip place to dance to electronic beats for the under 30s. A Vastly Renovated Marseille Has Some Great Things to See and Do.